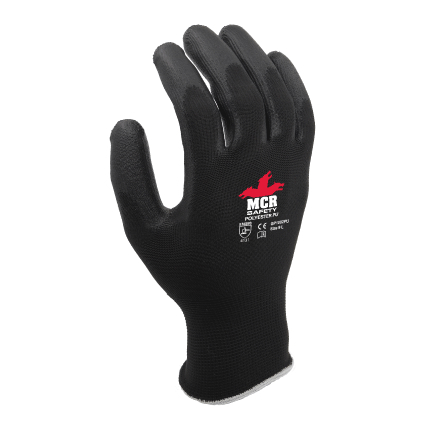 The MCR Safety GP1002PU PU Coated General Purpose Safety Gloves provide a fantastic level of abrasion resistance and sensitivity, great for manufacturing and construction industries. Their lightweight design and great fit makes them incredibly comfortable and easy to wear. To ensure hands stay comfortable while you work, the MCR Safety GP1002PU gloves have been developed to provide an incredible fit, helping you to work more easily. On top of this, the gloves also feature a lightweight design thanks to their polyester material, helping your hands to move more freely. The fingertip and palm PU coating on the MCR Safety GP1002PU gloves provides it with a great level of abrasion resistance, giving you extra protection where it's needed most. 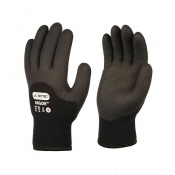 On top of this, the coating also gives the gloves an incredibly high level of sensitivity, helping you more easily feel objects to help you do your job. With excellent durability, grip and comfort, the MCR Safety GP1002PU Gloves lend themselves to a large variety of repetitive handling tasks. These characteristics have led us to recommend these gloves as a top pick for general handling. 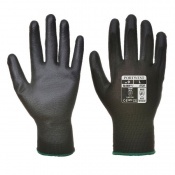 The MCR PU Coated Safety Gloves are available in four sizes that should be suitable for most users. To find your perfect size, please measure the circumference and length of your palm and refer to the chart below.